Imagine a time and space traveler from another planet. One that looks human and exemplifies the ideal world he comes from, a world free from human nature''s greed and cruelty. That creature would be "prot", as he calls himself, the newest patient at the Manhattan Psychiatric Institute. Prot seems to know more than he should about faster-than-the-speed-of-light-travel. And besides drawing constellations as viewed from K-PAX, the name of his home planet, "prot" can describe its orbit around double suns in unpublished detail. Who is "prot" and where did he really come from? Why does he have the ability to cure severe mental cases? And to disappear at will? And to charm everyone he comes into contact with? Bizarre delusion or reality? 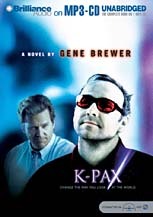 Listen in as a psychiatrist who specializes in delusional behavior documents his sessions with the man from K-PAX.